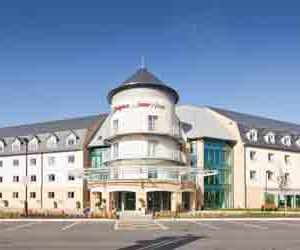 Drayton Manor Hotel0844 472 1950work01827 252444fax HotelSet within 280 acres of lakes and parkland, this modern hotel is just 250 metres from Drayton Manor Theme Park with a range of thrilling roller coasters. It offers 2 restaurants and rooms with flat-screen TVs. The Parklands Restaurant serves buffet-style meals featuring freshly carved roast and seasonal vegetables. Steaks, burgers and fish are available at the Brasserie and there are 2 bars for after meal drinks. Set within 280 acres of lakes and parkland, this modern hotel is just 250 metres from Drayton Manor Theme Park with a range of thrilling roller coasters. It offers 2 restaurants and rooms with flat-screen TVs. Each room at Drayton Manor Hotel is air conditioned and includes a private bathroom with toiletries. Some are themed in a Thomas and Friends style for children. Guests can enjoy 30 minutes of free Wi-Fi. The hotel is just off the A4091, close to Junction 9 of the M42 motorway. Tamworth Rail Station is just 4 miles away.